Chacuterie & Smoked Salmon Platter | eat. live. paleo. No cooking was required on my part here — but it was a good looking spread! 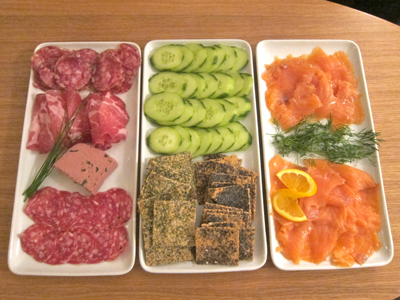 For hors d’oeuvres for our Christmas Eve dinner, we put out a spread of charcuterie and smoked salmon (2 types) alongside some nice gluten-free crackers and sliced cucumbers. The spread was colorful, festive and appropriate for a laid-back but sophisticated snacking before the dinner.